With the base roster of Super Smash Bros. Ultimate finally revealed, all new fighter and stage wishes and speculation now falls to DLC. Although the content itself has yet to be revealed, there are several things we do know for sure about the future DLC of Ultimate. There will be five DLC sets with each set including a new fighter, stage and music tracks. Each set will cost $5.99. All DLC fighters will receive amiibo releases as well. Piranha Plant will be available for free for early buyers and will be available to purchase in the future. This fighter is not a part of a DLC set, and therefore does not come with a stage and music. Players must purchase the digital version of the game or register their physical game card on a Nintendo Switch device by Jan. 31st, 2019 to receive this fighter for free. Piranha Plant will be available around February 2019. Additional content such as Mii outfits, spirits and game modes have not been announced as future downloadable content. As of now, only the Rex Mii outfit mentioned below has been announced, but this is not featured as a DLC set. As with the previous instalments, regular updates will be independent of DLC. Examples include character balancing, bug fixes and graphical changes. Echoes will not be featured in DLC sets, with only full-fledged newcomers being developed. There will be more new DLC fighters than in the previous games, as veterans no longer can take DLC spots with five in Ultimate as opposed to four in Smash for the 3DS/Wii U. All sets will be available for purchase in a reduce price bundle called a "Fighter Pass." This is not referred to as a Season Pass in any region. This bundle will cost $24.99. Each set will be made available as they are released. Players who purchase a Fighters Pass will receive an in-game outfit based on Rex from Xenoblade Chronicles 2 starting December 7th. My Nintendo members who pre-purchase the digital version of the game with the Fighters Pass in Nintendo eShop or on Nintendo.com before 11:59 p.m. ET on December 6th will earn 425 bonus Gold Points, double the usual amount. These points will be added to member accounts on launch day. DLC development is slated to end February 2020, with all currently announced DLC sets made available before then. This means known post-launch development for Ultimate will be at least 13 months long, while Smash for the 3DS/Wii U lasted about 16 months. With DLC development likely underway for Super Smash Bros. Ultimate, what do you hope to see added to the game in the future? We look forward to seeing your thoughts! 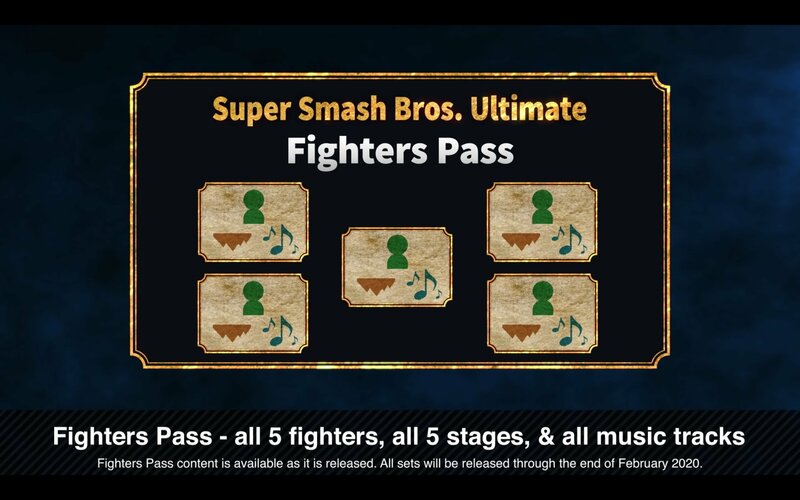 I'm not buying the Fighter's Pass, but if there is a fighter with a stage and music I like, I mighg buy a single pack. I would like to see a Millennial Mode in which everything that could possibly offend anyone could be toggled on & off. I know a lot of people were unhappy when it was announced that Nintendo had already chosen the DLC fighters, but that just seemed sensible to me. I have to imagine that the number one most important and difficult part of adding a character to Smash is securing the rights. Some people took that news to mean "Well, that means no fan favorites." If anything, I think it might mean Nintendo is doing their due diligence, making sure they have secure arrangements in place with, say, Square-Enix for Geno or Microsoft for Banjo-Kazooie. I like the fact that they haven't begin to work on them. It means it's real DLC like it should be done, not "parts of a game removed and sold as DLC". That's smart. That's how DLC should always be done. Again, it gives more 's more consistency, as we saw with Mario Kart 8's DLC or Smash Bros U's ones. What’s most fascinating to me is that Nintendo itself has chose the characters, and not Sakurai. Makes me think we’ll see less third party content, which is what I prefer, anyway. My geeky dream DLC characters : MASTER CHIEF & KRATOS. So you can do epic fights between Nintendo, Sony & Microsoft. Dixie (ponytail used for moves + gliding) or Cranky Kong (pogo stick cane) please! Aside from King K. Rool (yay) either of these is what I really want as DLC. Still holding out for rayman. @thesilverbrick I think it means more third party deals. I’m sure Nintendo would love to make connections with companies like Ubisoft or even Microsoft. Gives them better standing in the industry. "This is not referred to as a Season Pass in any region." At any rate, I got the game for 20% through Amazon Prime (and just in time, too), so, yeah, sure, a few more bucks than normal price? No big deal. @TheFanatic Banjo is really a dead-end choice for Nintendo. We’re talking about a character entirely owned by a third party who will never appear on Nintendo hardware again. Nintendo isn’t going to hand Microsoft free advertising when they can just promote their own first party games by pushing first party characters. @Monkeido How Dixie, Cranky, Peppy, and Slippy aren't already in to round out 4-player teams, I'll never understand. And I guess Bandana Dee? Used to be Waddle Dee/Adeleine. I want Rabbid Mario so badly. @thesilverbrick I dunno, I think it’s plausible. Cloud is a Sony exclusive character which never appeared on a Nintendo console thanks to its lack of power. Regardless, he’s in. Banjo and Kazzoie are possible, but they’re probably the hardest to acquire characters Nintendo will ever hunt for. @TheFanatic And, to add to that, it seems that it was foreshadowing the FF ports to the Switch. Or perhaps brought that about. Not sure. Either way, if it means BK1 on Switch (or N64 Mini, I guess), that's worth pursuing in my book. @KingBowser86 FF7 was Iwata's favorite game. @SethNintendo I was just summarising, chill your boots. And don’t be under any dillusion that the new FF7 Remake is coming to Switch. It won’t be out until like 2021 anyway, and it has no hope in hell on running on the Switch. I don't buy the fighters pass just yet, because I don't know what's in it. As soon as we know wich characters are in it (and I like it) I might get the pass. Otherwise I might just go for individual packs. I reckon Funky Kong is more likely. Nintendo seem quite keen on him. The last point is the most worrying sign to me. 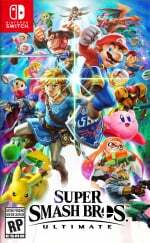 After the bold statement from Masahiro "screw you, Miyamoto, Kirby stays pink" Sakurai that "only I decide who's in the game", the DLC character list is decided by Nintendo themselves, which is a "you went overboard with third-party characters, those @#&kers cost, , we take over from here" situation at best. At worst? Well, let's just say that Pink Gold Peach's infamy in Mario Kart 8 puts Piranha Plant in a disturbing new light. @AlexSora89 Or he's sick of people harassing him about the characters and wants them to leave him alone about it. You made a whole slew of jumps and assumptions to get to your conclusion there. @TheFanatic Cloud was never owned by Sony and had appeared in games on Nintendo consoles before Smash 4 (albeit in smaller, non-canonical roles, such as in Theatrhythm Final Fantasy). Plus, Final Fantasy games have been appearing on Nintendo consoles for years, and FFVII itself is coming to Switch in 2019. Cloud was a bit unorthodox, but he isn’t exactly a dead-end choice, seeing as he’s a free agent, in terms of ownership and licensing. On the other hand, Banjo will never have a game on a Nintendo machine ever again and is owned exclusively by a rival console manufacturer. It’s a totally different situation. @BoFiS If you want the game delayed another nine months or a year, then sure. Adding and balancing characters takes huge amounts of time, and they haven’t even started developing the DLC yet. If they add DLC to the game will they add those characters to the poster/character poster. In the comment section tell me if (you think they will or won't). so that means the leak could be some DLC characters maybe. @thesilverbrick You’re more then entitled to that opinion, but don’t act like its fact. We’ll see over the next year or so who’s right. Also, not once did I claim that Sony owned FF, only that his game was Sony exclusive, and born during a heated competition between Nintendo and Sony. @thesilverbrick Or they could just make the DLC free and we have a win-win. Funky is boring. Bleh. Might as well add Candy and Kiddy Kong too. I’d die if they added Lanky (he’s my favorite). Facetiously, I'm calling the total possibility of Shantae's inclusion, as more than just a "spirit", or whatever, that was visible in the Direct. I'm talking like as a roster member, or Mii fighter costume. Pirate Shantae, w/ her flintlock pistol would make a Mii Gunner. Edit: Also, how is Zero a spirit? Come to think of it, how can X throw a hadouken? @Snaplocket They could, but the developers who work over the next year to make these fighters deserve an income, don’t they? @TheFanatic FFVII wasn’t on the N64 due to technical limitations of the console, not because of any licensing issues. As soon as Nintendo released a console that could handle Square’s ambitious projects, Square jumped right back on board and started releasing Final Fantasy games for Nintendo hardware again. Banjo and Kazooie aren’t on Nintendo machines for an entirely different reason, and I highly doubt that Nintendo wants to draw attention to a direct competitor’s exclusive IP by including it in one of their games. Or, Nintendo could have 4 representations of one character - by adding the Link trio from that Triforce Heros game. They would operate like Ice-Climbers, or Duck Hunt. This is just a guess, not a hope. @Audigore0733 I doubt it. They didn't add Piranha Plant. Edit: Stand-alone Fighter Pass will be available Dec. 7. Well, that too, but the conclusion I came up with made it stupidly easy to connect the dots. Hope that updates will add new/missing modes, and that echos may happen in addition to the 5 new fighters. And hoping that its so successful that they consider doing a second wave after the first wave is done. @AlexSora89 all credible leaks indicate that a Square fighter is coming via DLC. So Nintendo choosing the fighters may not have to do with the costs of those fighters. And a Square rep is definitely a far cry away from the likes of Pink Gold Peach, so I don't think there is too much to worry about here. With such a large roster already I won’t be getting the fighter pass but maybe an individual pack if there’s someone truly special. @thesilverbrick "if you want the game delayed another nine months"
There are 64 characters already in the game and only 5 more DLC characters. If you think it would take another 9 months for 5 more, then you must think it took about 12 years to add the current ones into the game. Plus all the spirits stuff and 100 levels and other stuff that is already in the game. And despite people complaining about trophies there is still a ton if stuff in the game. The Wii U game came out 4 years ago, and this is supposed to be a new game not a port, yet they managed to balance 64 characters on all those levels in only 4 years. That's about 15 per year, so another 5 should only mean delaying the game a few months, if they wanted. And as far as getting paid, people who made this game worked 4 years for 64 characters and 100 levels, for a $60 game. That's about $1 per character and all the levels, music, spirits stuff, is included. Do they really need $25 for 5 more characters and levels? The people making the DLC may need to be paid, but do they need to be paid $5 per character rather than $1? Should barely 1/14 of the game cost 2/5 of the price in order for them to get paid? Everybody needs to get paid, and everything takes time to make, but 4 years for 64 characters and 100 levels for $60 followed by 9 months for 5 characters and 5 levels for $25 is some really funky math all around. So how will the DLC be handled now that we have online subscriptions and accounts? Will anybody on your Family plan be able to use the characters or only the people who bought them or anybody on 1 Switch? We bought the season pass for Mario & Rabbids and all 3 of our accounts used it no problem, but would like to see it clarified and explained. Shouldn't one of the Assassins Creed characters be expected to be in this game after Mario & Rabbids? I mean yeah a rabbid would make more sense after that game but an AC guy would probably fit better. Or why not both? They both already had NFC toys shown off in Rayman Legends, so their amiibo were probably already discussed behind the scenes at one point. @rjejr For starters, only six characters in this game are essentially brand new. The other remaining “new” characters are clones of existing characters with minimal adjustments. The base roster of the game (save for Inkling, Ridley, K Rool, Simon, Isabelle and Incineroar) is built on characters that have been functional and relatively balanced for many years and installments now. Sure, they’ve received minimal tweaks and balances, but there’s no way that can be as time-consuming as building characters from the ground up. Granted, I don’t think creating and balancing five characters, each with a stage, needs to take a year with the huge team available, but I can guarantee the development team is going to be reduced considerably to handle just the DLC. And since a year of additional work is going into this extra content, I think it’s only fair that we pay for it, considering these hard-working people deserve an income. It’s not up to you or me to decide how much they should be paid or how hard their job is. Fact is, they have given us a very large and very substantial base game, and the remaining five characters and stages are simply extras that we can opt into as a bonus if we choose to do so. The game we are receiving in December is absolutely complete. What is to come over the next year is simply extra. And since extra time and labor will be spent beyond the scope of the original project, I don’t think it unreasonable at all that they are charging for it. The good news is, anyone who does think it’s unreasonable doesn’t have to buy it. And they’ll still have a very large and very complete game. 5 Nintendo only characters please. Thank you. This has me worried, /Nintendo/ has already chosen the DLC, instead of Sakurai. Which probably means we will get a Fire Emblem character, Steve from Minecraft, generic Fortnite character etc...So odds are we won't be getting any /out there/ characters and or the characters will be so far /out there/, people will just turn their heads and wonder who and why "X" is in the game. As for the Mii costumes not being DLC, I always wondered why Mii's got all the costumes and NOT the characters. Where's Dry Bowser, Boshi, Mewtwo with the "armor" from the movie. etc...I would much rather have those. "With DLC development likely underway for Super Smash Bros. Ultimate, what do you hope to see added to the game in the future?" Ralsei from deltarune as a playable character. Stage; Card Castle with Chaos King being a stage boss. I would easily give up a chance to have /all/ of my top ten characters, for this one. @thesilverbrick Yet they somehow don't deserve that income if the game is delayed and we have to pay extra money? I can wait a few months until they reveal a character I actually want. I just bought Let’s Go Pikachu and I plan on getting the Pokéball Plus, so I wont be able to afford the DLC anyway. @MrGuinea You're also getting a DLC character specific stage and 2-3 music tracks with that too so I could see why it's $6 per fighter. Since Nintendo are the ones making the choice this time, let's hope the DLC fighters are worth it. Hopefully we see more reps from F-Zero, ARMS (I know Ribbon Girl and Spring Man won't be playable but they may still choose another), and Golden Sun. Though we won't get Isaac from Golden Sun as a playable character that doesn't mean we won't see Felix or Matthew from the later games to Smash Ultimate. There's still hope for Mach Rider, the Chorus Kids, and Banjo-Kazooie. FF7 isn't mentioned there at all. @Snaplocket If the game is delayed, it's because of production issues or unforeseen problems, and the additional costs associated with paying the staff should be eaten by the developer. In this case, we're talking about a team of people working for an extra year on a planned set of extras, made as an option for an already very complete game. It's not at all the same thing. @thesilverbrick I typed that because you stated earlier that putting them in the base game would result in the game being delayed by a year. @thesilverbrick Nintendo chose the characters, but Sakurai is still the creator of the game. He sees the list of characters Nintendo gives him and decides which ones are actually put in the game himself. He can handstand when he needs to. im hoping rex with mythra is one of them. @Reigestugatensho But Nintendo is making the list of characters that Sakurai is picking from. He’s not coming up with suggestions himself this time. I reckon Nintendo will give preference to suggestions that benefit them the most, meaning more first party content as cross-promotion for their own IP. I genuinely think that the final dlc character will be waluigi. It’s all building up to him finally getting a break. And he’ll be ridiculously overpowered. If Nintendo mandated it, then the Square rep might (might) not be Geno. Sakurai's going for the niche kind of crowd-pleasing (aside from his own desire to see Geno in the game) while Nintendo might more realistically be on the practical kind of crowd-pleasing (Terra, Bartz, Noctis, Sephiroth, Sora, DQ rep, Neku are all viable choices in that regard). Time will tell, I guess. They really need to come to their senses and add VECTOR MAN as well as BATTLE TOADS!!!!!!!!!!!!! if anyone could look them up. You'll see why theft possibilities are endless for those fighters!!!!! @Matthew010 watch all 5 fighters, stages, and music be stuff u like. @edgedino I'm expecting that now. The thing is, I don't know what I'd like. Sakurai can surprise me! @AlexSora89 I don't believe I even mentioned Geno. Point was that any Square rep is gonna be significantly more exciting than the likes of say Pink Gold Peach. 1. Crono from Chrono Trigger. At least showed up on Nintendo systems twice, right? 2. Will never happen, but some real-life Nintendo rep like Miyamoto, Reggie, or Sakurai himself. I would so main Miyamoto. 3. The little fake Kraid from Super Metroid that gets taken out with one super missle. Tails is all I want. Gimme Tails, Nintendo! @AlexSora89 Calm down, we don't even know who it is yet. For all we know, Sakurai could've wanted them in all along and Nintendo has only just now been able to secure the rights. Plus, aren't Sora and HAL part of Nintendo? I feel that Geno and Bandanna Dee have shot. The last third party character will probably be Rayman. @KingKamina9999 I love the idea of Giovanni or Medusa. All this info straight from the last direct. What I'm curious about is can we expect more Echo Fighters? They did say all 5 characters will be brand new but they never deconfirmed the possibility of more echo fighters. There is still quite a few picks that would make too much sense such as Octolings, Dixie Kong, Funky Kong, Medusa, or hell even Gardevoir as a Mewtwo Echo. @Reigestugatensho I can try to think up some, though they are pretty obscure. Pandora (Kid Icarus), Lord Fredrik (Donkey Kong: T.F), Mad King Ashnard (Fire Emblem: Path of Radiance), Ashera (Fire Emblem: Radiant Dawn), Zant (Twilight Princess), Weavel (Metroid), a Zeta Metroid (Metroid. If Piranna Plant can be a PC, so can a Metroid). Though I rarely pre-order games or season passes, I'm planning to make an exception with the fighters pack since I'm confident in Sakurai, but I'm really wondering who was picked. People keep saying that Nintendo chose the DLC fighters, but a lot tend to assume that Nintendo is treating Sakurai like a work horse with five specific choices. The way Sakurai worded it, it sounded like he was given a list or pitched ideas for characters, otherwise it wouldn't matter if he decided whether they would make good fighters, he'd just be doing it. Of course, Sakurai could just be being vague, but there's no way to guess anything right now. @KingKamina9999 Maybe Captain Syrup from the Wario Land games. She's been around for a while, and is the closest we have to an arch enemy of his like Border or Ganondorf. It is really annoying to see everything censored all the time. If people can't take it, they should stay away from every single media. @BoyfriendOfDeath I hope for Metroid to be a playable character as well, but I thought they already said that was a confirmed assist trophy? Yep, but Sakurai kind of had free reign over his choices. That's what got me worried - his vision shouldn't be tampered with. Provided Nintendo doesn't mess around too much, that is. Sorry for the not-elaborated-on-too-much reply, but these days I'm working kind of hard and I'm way past my bedtime now. As said elsewhere: give me a holler tomorrow and I'll do my best to reply ASAP. @AlexSora89 Guess I don't see any point or reason to be pessimistic and assume the worst like that at this time. It should be obvious that both the likes of Pink Gold Peach aren't gonna be the new fighters we receive via DLC, and 3rd parties are not the reason why Nintendo chose the DLC when it seems all but confirmed that we'll be receiving at least one 3rd party fighter via DLC. @Reigestugatensho The Metroid that's an assist trophy is a Larva Metroid, which is the 3rd stage of its life cycle. A Zeta Metroid is the 6th in a Metroid's life cycle. It is extremely different from the Larva. Look it up and see. I guess we're stuck playing the waiting game, again. Maybe I'm just mad about - mere minutes after the final pre-DLC roster being confirmed - the announcement of a "fighters pass" without being told which fighters are in it (nevermind that the names are already set in stone) inevitably put us back in the dirty claws of mindlessly clickbaiting speculation, disguised as "countdown videos" again. It's less of a single pet peeve and more of the sum of its parts, basically. Neither the lack of a list of fighters, the speculation, the complete over-reliance on hype culture and reaction videos that alone fuels the word-of-mouth portion of Smash's marketing, the fact the fighters aren't picked by Sakurai himself, nor the fact they're already being sold without telling us who they are is the problem. However, all these factors together are enough to make anyone, even the most "confident in the value", slightly nervous at best. The aforementioned speculation is only the icing on the cake.